I've spent my whole life as a loyal breakfast lover. In fact, most mornings, my 'getting ready' is worked around having a bowl of cereal and, as guilty as I am, I always go way past the 30g serving reccommendation. I can't help it - I consider it part of my make-up, my genes, imbedded in my brains. But, of course, as life gets on, and my body starts 'becoming an adult' (*rolls eyes*), I do feel that it is required to pay a little bit more attention to what I'm eating. For example, in 2018 I plan to cut out my favourite cereal, Crunchy Nut Cornflakes, from my routine diet and start replacing it with foods that are a bit more benefical to my body and can help me through the day. This one is great to do the night before and pick out of the fridge on your way to work if you're the kind of person that doesn't really 'do' breakfast because of the inconvenience. 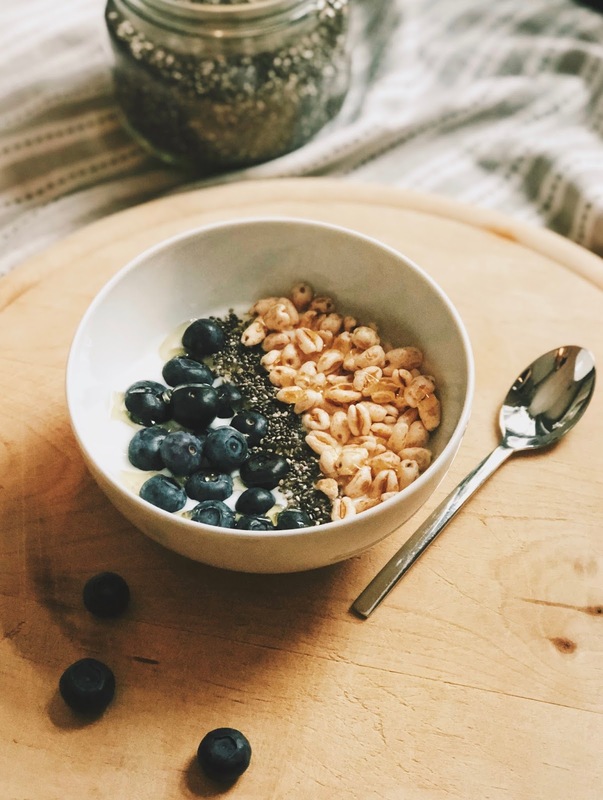 The great thing about this dish is that it can be packed full of all of your favourite things and, with the addition of rolled oats and fruit (which are both extremely beneficial for a functioning body), you can also add one or two cheeky faves. My recipe for Overnight Oats starts with grabbing a handfull of your desired fruit and mashing them down to release the juices. The fruit you add can be anything you like; I enjoy adding fruits such as strawberries and blackberries. If you want to add fruits with a skin (such as blueberries and cherries) it's best to leave these until last, too use a topping, because they don't tend to mash as easily as the others. Next, I add 6 Tbsp of Quaker's Rolled Oats, 6 Tbsp of Low Fat Natural Yogurt, 1 Tbsp of Chia seeds which are particularly good for adding fibre and protein into your diet, 1Tbsp of mapel syrup and 1 Tsp of Vanilla Extract to add sweetness and counteract the bitterness. After I've mixed that all together I honestly just guess the amount of milk that I put in, it just depends how I want the consistency to be at that particular time - it's all just preference. I didn't actually realise that a lot of people out there just don't seem to understand that a smoothie can double up as a meal. If you pack a smoothie full of nutrient goodness, you can not only have a super easy on-the-go, easy to consume meal, but you can have around 3 of your five-a-day. Fruit smoothies are the most popular ones out there and, in order to keep your smoothie cool without it being watered down by ice cubes, it's so great to freeze your fruit. One of my tips is to check out the 'Reduced' section in your supermarket fruit and veg area - a lot of the products there aren't yet bad and are just being sold off for the sake of shelf space and replenishments. I recently grabbed a packet of blackberries that were completely fine, then popped them in the freezer when I got home to add to a smoothie another day. Don't be scarred to add veggies too; anything from spinach, carrot and cherry tomatoes. A lot of the time, they add a hella lot more nutrients that they do flavour which means that you don't lose your favourite fruity tastes. Puffed Wheat: If you get plain puffed wheat with no additives, it's a great source of fibre and adds a perfect crunch to the dish. I like adding these in because, without being too intrusive or negatively changing the nutritional values of the other items, it gives more texture and a wonderful flavour. 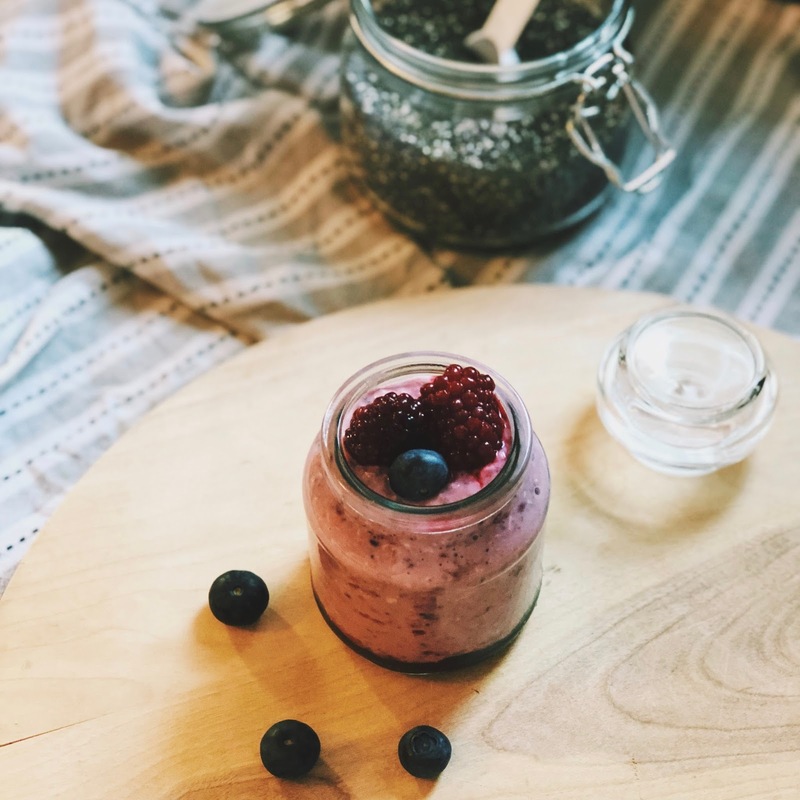 Chia Seeds: As I said earlier, they are an excellent source of protein and fibre and, I'm not even going to lie, you totally forget that they're there. Try adding a tablespoon of these to your diet once a day for an extra boost. Blueberries: I may be biased as a fan of blueberries (cus they are my favourite fruit), but these little blue gems are SO amazing. They're packed with antioxidents and, in some cases, have qualites to help with brain help and supposedly prevent cancerous illnesses. With their delicious flavour, it's a no-brainer for me. Honey: Don't be afraid of sugar. I know, I know, people deem it as 'the silent killer' and perhaps the last thing that you need to long lasting energy but, I think there's nothing wrong with adding a little bit of sweetener. Honey is actually a little better for you and does carry a few benefits. This one has to be one of my favourites but is probably the kind of breakfast to choose if you've got a bit more time - yet equally as easy to make. There are so many different ways to make pancakes while adding some fruit in there too and you'd probably be surprised at some of the fruits you can add. From oranges to pears and lemons - I love referring to this Cosmo article for my fruity pancake inspo. What are your favourite breakfast recipes with a healthy twist? When I was at uni, I had a smoothie for breakfast every morning, no idea why I stopped. I'm so lazy with breakfast, I prefer the extra 10 minutes in bed and grab a banana on my way out of the door. Really need to make it more of a priority. I went through a stage of smoothies and yogurt bows but I have actually never tried overnight oats! I keep meaning too as I could so easily just take it to work.